The hyper-partisanship of current American politics found its most extreme expression last week when more than a dozen prominent Democrats, including two former presidents, were the targets of explosive devices apparently mailed to them by a fanatical supporter of President Donald Trump. Before authorities arrested suspect Cesar Altieri Sayoc Jr. in Florida, Connecticut Sens. Chris Murphy and Richard Blumenthal were advised to take additional security precautions against what Murphy termed “a coordinated assassination attempt.” And though Trump himself condemned the acts as “abhorrent to everything we hold dear and sacred as Americans,” the pitch of the partisan rhetoric — and the nation’s level of gun violence — did not diminish. The contest between Republican gubernatorial candidate Bob Stefanowski and Democrat Ned Lamont is verbally no less ferocious – and, according to a recent poll, nearly a statistical tie. 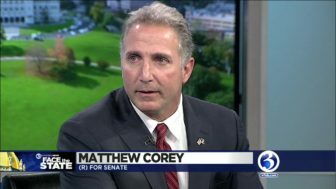 Matthew Corey, GOP candidate for U.S. Senate. Stefanowski, who released some of his tax history Saturday, has been talking primarily about his campaign’s central organizational concept: phasing out the state income tax, but explained last week that while his campaign ads don’t say so, no cut is contemplated for at least two years and none are guaranteed. His approach to education, he says, is that of a businessman: making sure educational funds are being spent appropriately and effectively. Stefanowski took some heat from Lamont after a comment he made about vaccinating children before attending school which he said he does not believe the government should be able to legally require. Lamont, for his part, agrees with Stefanowski that more must be done to give teachers incentives to work in the state’s troubled inner-city schools; and said he prefers improving public schools instead of building new magnet schools. Lamont’s stand on municipal aid, education financing and higher education, meanwhile, seems in conflict with the need to address a huge budget deficit awaiting the new governor, whoever he is, after the election. Funding the state’s transportation needs — part of any economic recovery — will go before state voters in the form of a referendum on creating a “lock box” protecting state transportation taxes. The importance of voting, at least, is being more widely recognized; and a record 44 percent of U.S. firms — including some in Connecticut — will give workers paid time off to vote on Nov. 6, up from 37 percent in 2016. The mid-term elections, after all, will determine control of both houses of Congress and the Connecticut legislature. If Democrats take control of the U.S. House, some of Connecticut’s senior representatives stand to move into positions of leadership. On the state level, there are a number of swing districts in play, including the 65th House seat currently held by State Rep. Michelle Cook.